"Downsizing", in the real estate sense, is a term which describes someone's decision to live in a smaller property with fewer possessions. Many people do this later in life when they find their family homes too large or expensive to maintain, but people of all ages may downsize in an effort to save money or lead more simple lives. If you are considering downsizing, look at your potential monetary savings and other benefits and weigh these against any associated costs of downsizing. There is no right answer to the question of should you or should you not downsize, but looking at your own situation objectively may make your decision a little easier. There are usually substantial monetary savings to be had if you downsize your home. Mortgage payments (both principal and interest), insurance, utilities, household and property maintenance and associated taxes all stand to be reduced should you move to a smaller property. Depending on the area to which you would move, the cost of living may also be reduced and if you sell the possessions you suddenly find extraneous for your new home you might be able to add these profits to your savings as well. If you take out a mortgage for your new home, you might find that you also qualify for better rates than your previous mortgage and the same for your overall insurance requirements. The trick to making the most monetary savings should you downsize is to thoroughly research all locations, properties and options before you make your decision so that you know exactly how much you stand to gain with each one. 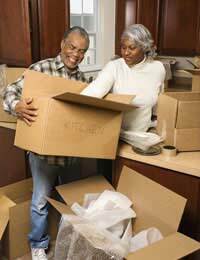 Downsizing may bring other benefits besides monetary savings. Less property to keep up means less time and energy spent on maintenance, cleaning, decorating and general upkeep. Less utility usage could mean a smaller carbon footprint in a new home. Living with fewer possessions might lead you to feeling less anxious about the safety and security of objects not to mention that living in a smaller home might also lead to greater interaction between family members and more imagination in decoration and storage. These benefits might be less tangible than holding onto more money, but for some people they are just as important. Downsizing will not be without costs, however. You will have expenses associated with the sale of your home, and you may need to find storage for extra possessions until you can sell or otherwise dispose of them. Depending on your new home you might also have to pay for cleaning, decorating or repairing items. Less tangibly, you will undoubtedly be sacrificing space in your new home meaning less time or distance away from others, less surface area for your possessions and possibly even less entertaining or hosting friends and other guests. There might also be a high emotional cost of leaving a beloved home which can not be discounted in the decision to downsize. Downsizing properties can be a great way to save time, energy and money associated with your home, but it also brings associated monetary and emotional costs. If you are considering downsizing, do as much research as possible so that you know the potential savings, benefits and drawbacks of each option. Only when you know these variables can you make a truly informed decision.